Pump-back storage systems utilize two reservoirs at different elevations. 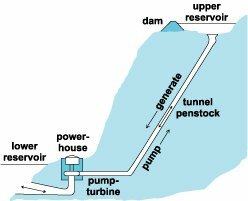 To generate power, water is released from the upper reservoir to the lower, powering a turbine on the way down that is connected to the grid. In 2014, the Dolores Water Conservancy District released an investor’s memorandum on the potential for a project at Plateau Creek to inform energy companies and investors of the opportunity. The canyon’s steep vertical drop in a short distance makes it a good location. District General Manager Mike Preston, speaking at Thursday’s board meeting, described pump-back storage plant idea as giant battery that is part of a green energy power grid. When electric prices are high, the water is released from the upper reservoir through a turbine, and the power is sold to the grid to meet demand. When electric prices are low, the water is pumped back to the upper reservoir through a tunnel, recharging the battery. The Dolores Water Conservancy District holds the water rights for the potential Plateau Creek project, estimated to cost $1 billion, based on the 2014 study. It would require environmental reviews and approval because it would be on San Juan National Forest land. McPhee could be used as the lower reservoir, with a small reservoir built above Plateau Canyon. The project needs investors before it could get off the ground, but once online, it would generate an estimated $100 million per year in electricity sales. As the holder of the water rights, the district could benefit financially from the deal. “We have the site, and if we could realize a revenue stream, it would help the district financially,” Preston said. Shortly after Absaroka Energy’s visit, the district received a letter from Matthew Shapiro, CEO of Gridflex Energy, based in Boise, Idaho, expressing interest in exploring a pump-back storage system at McPhee. Pump-back hydroelectric storage is considered a nonconsumptive, green energy power source. Energy companies are potential investors in hydro projects as they expand their portfolios to include green energy. They need supplemental sources to meet demand when the sun does not shine or the wind does not blow. The Dolores Water Conservancy District had obtained a preliminary permit for a facility at Plateau Creek from the Federal Energy Regulatory Commission, but it was not renewed in 2016 because the project had not moved forward enough.